Equipment is the combined form of weaponry and gear the player has on them. To equip an item is to hold it. 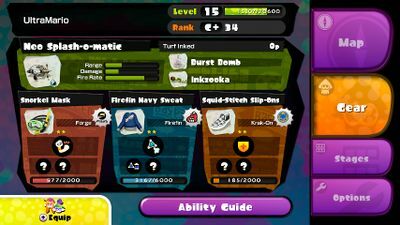 The gear menu as seen on the GamePad. The Gear(NA)[a], or Equipment(EU/OC)[b] screen is a menu on the Wii U GamePad. As well as a link to the Ability Guide. Pressing on opens the equip screen. The equip screen. 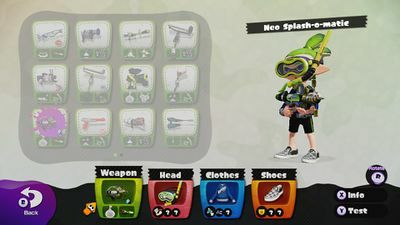 An Inkling is modelling the Snorkel Mask, Firefin Navy Sweat, and Squid-Stitch Slip-Ons. From the equip screen, the player can change their weapon or gear. Information about each item can be read by pressing . When a weapon is highlighted, can be pressed to access the Shooting Range with that weapon. The player's Inkling can be rotated with . Various weapons on the equip screen. The Hero Charger Replica is selected. The equip screen in Japanese. The equipment menu in the European and Oceania version. This page has been accessed 16,327 times.